As the realm of animation continues to evolve with time, so too does the breadth of its target audiences, reaching a point where violent and disturbing animated films engineered for adults -- outside the safe space of Japanese anime -- have found the means to flourish. The works of Ralph Bakshi and the Richard Adams/Martin Rosen team paved the way for these works to discover the right audiences, but it's taken incremental bravery and pushing of boundaries to reach a climate where the likes of Birdboy can take flight. 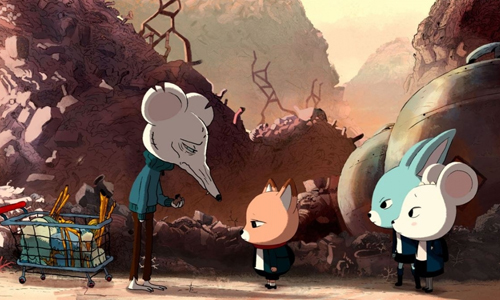 Originating as a short film, this creation from Pedro Rivero and Alex Vasquez blends drugs, depression, and murder in an almost post-apocalyptic environment populated by animals, one that doesn't try to transcend the line separating children's entertainment and that designed for adults. 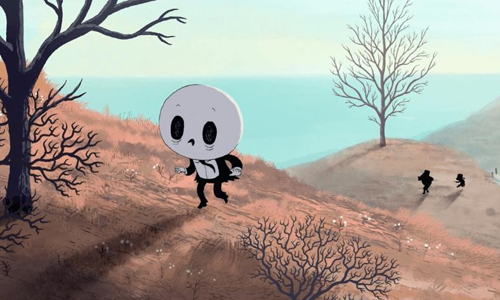 Birdboy telegraphs hauntingly beautiful images and characterizations around its narrative of ruined innocence that won't soon be forgotten, though the widespread, overly ambitious nature of its social commentary prevents it from completely sticking its landing. On a remote island that was once a fishing community, peace and prosperity flourished among animals of all species, largely hinged on a recently-built industrial factory that kept its population employed. A mysterious explosion has decimated the island, though, leaving the mice to largely fend for themselves and salvage for valuables amid the trash rubble of the aftermath. The tone has obviously shifted in the town, observed directly in young student Dinky's household, in which her devout Christian parents disparage her studies and attitude. As she plots to flee the island along with the other students, a murdered drug dealer's elusive son -- Birdboy -- struggles with an addiction to several different substances that seem to keep his darker tendencies under control. Elsewhere, the film offers a glimpse at other families coping with the post-incident environment, such as a fisherman trying to make a living in fishless waters and a father-child mice duo scouring the violent wasteland for scrap metal. Alberto Vasquez and his art department render haunting water-locked landscapes and nightmarish imagery in Birdboy, where deceptively soft and calming shades that bring life to the island are interrupted by brash reds and acidic greens jumping out from oppressive shadows. Lighthouses, garbage-dump mountains, and almost Miyazaki-like cavern sanctuaries for forest life form into a mesmerizing portrait of a once beautiful place rendered unnerving and ominous, something that also carries over into the delicately detailed mammals and avian creatures alike. In fact, the nuances of the animation makes sure that those watching will pick up on the sadness and futility within both the characters and their surroundings, and while the world's rendering is indeed beautiful, that lack of joy radiates from every character through their strung-out eyes and despondent expressions. Perhaps the closest thing to joy can be spotted when Birdboy gets a much-needed fix and collapses on a pier, whereas there's a gradient of anger, fear, and viciousness observed throughout the children's trials. The visual adventure of Birdboy does mesmerize from start to finish, but it isn't always reliable or symbolically comprehensible, and that applies to many of the film's most provocative visions. Directors Vasquez and Rivero establish early on that heavily-shadowed imagery featuring manipulated versions of the setting's creatures is tied to drug use or otherwise hallucinatory elements, and that grows complicated as these elements -- such as a large spider escaping from a person's nose and expanding in size -- begin to enter the physical world. For the most part, drawing distinctions between fantasy and reality isn't difficult with Birdboy, but the film's insistently metaphorical ambitions and varied world connections muddy things enough to make one second-guess the authenticity of what they're seeing. The consequences of those sequences typically latch onto enough perspective to figure out what's really happened, and personal interpretation fills in the rest of those gaps. This is certainly a stimulating viewing experience, one that doesn't hold the audience's hand while guiding them through its environment. Birdboy, which also carried the subtitle The Forgotten Children, is also rather dark, to a degree where it's difficult to express whether I genuinely enjoyed where the narrative took me and made me feel, largely because of this absence of tonal variety. Those who appreciate bravery through the medium of animation should find something to be impressed with in its patchwork of dark tales, in which the storytelling addresses the reliance on antidepressant pills, paying for the sins of one's parents, and the violence that seems from desperation and competition over the means to feed one's family. Quite a bit of death occurs in the story, and the directors don't turn away from it, allowing blood to spill, claws to scrape, and bullets to pass through bodies … or heads. A few moments get to Watership Down levels of hack-‘n-slash brutality, but these animals have been anthropomorphized in ways that elevate hardships, especially those within the lawless realm of mice salvagers among the factory wasteland. Except for Birdboy and his ability to fly, these are human characters in animal skin, and their suffering is felt through that lens. None of the bleakness of Birdboy lacks purpose, though, as nearly every facet of the film comments on grievances one might have with the spectrum of society, stemming from industrialization and pouring into the desperation of class inequality and abusing substances to block out reality. To the filmmakers' credit, each of the topics explored requires some additional mental legwork to reach their meaning, such as how drugs factor into Birdboy's inner demons and how cutthroat mice reveal what they do about the ugliness of desperation, which keeps its takedowns from appearing heavy-handed. Birdboy critiques so many ugly elements of society that it can also appear imprecise and broad-stroked, which doesn't pair well with the unyielding austerity of their surface narrative, overburdening it with pessimistic aspirations that are given only the faintest sparkles of hope in a nihilistic conclusion. Salvaging optimism from the rubble of what transpires is a challenge, and the splendor of visuals and thematic intent can only go so far toward making such a harrowing journey worth taking.